Here are some sweep stick progressions that will improve your ball handling, reduce turnovers by improving ball toughness, and improve your ability to blow by the defense. While these are beginner progressions, you can use the sweep stick with advanced drills as well. When using the Sweep Stick, get in triple threat position with the Sweep Stick directly in front of you. Sweep the ball in a “U” shape motion to the other side. Keep your eyes up so you can see the entire court. Move the ball fast from one side of your body to the other and then back. When you hit the Sweep Stick, you should be hitting the middle of the Sweep Stick. Hitting the middle will make the most sound and it will force you to keep the ball low. After working on the sweeps, the next stage is getting a step involved. The ball will begin in your left hip. You will sweep to the right hip and then take a step with your right foot while simultaneously dribbling with your right hand. The dribble must be outside the right foot. Just take one dribble and then come back and repeat the process. You will again sweep from left to right using a strong side step, but now you will be taking three dribbles and coming to a jump stop. If you have multiple Sweep Sticks you can place them at opposite ends of the lane and have two players working at once. The step of the progression is to use a crossover step. Many of the same aspects will remain the same, but the footwork will be a little different. Again, start with the ball on the left hip, sweep low in a “U” motion to your right hip. As you sweep, you will take a crossover step with your left foot. The foot will step in front of your body and you will dribble with your right hand. The Dribble must be protected by the crossover foot. 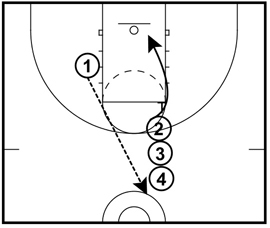 You will sweep from left to right, this time adding in a crossover step. Similar to progression 3, now you will be taking three dribbles and coming to a jump stop. If you have multiple Sweep Sticks you can place them at opposite ends of the lane and have two players working at once. The progression will apply all the following progressions and will finish with a lay-up at the basket. Set up the Sweep Stick at the right elbow. 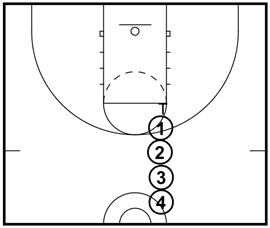 Give each of your players a basketball and have them line up directly behind the Sweep Stick. Player one will begin in a triple threat position with the ball on their left hip. Player 1 will sweep the ball from inside to outside (left to right), hitting the middle of the Sweep Stick. After sweeping the ball, he/she will take a step forward toward the basket with their right foot, then take one or two dribble and finish with a lay-up. Their first dribble after the sweep should be outside of their foot. This will keep the ball away from the defender. After player 1 has finished the lay-up, player 2 will begin the process. 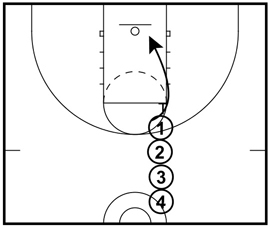 Player 2 will sweep, step, dribble and finish. Player 1 will go to the end of the line. The drill will continue with each player performing the same motion. The drill should be run from each side of the court, teaching players to sweep from left to right and right to left. This will also work on footwork by allowing them to take the first step with both their right and left foot. Simply Click here to order the Sweep Stick. Where can I purchase a sweepstake? Kids at the youth level will have a hard time looking up, "maybe" this will help but its a hard habit to break. Players in your posted video were looking down most of the time. Post some drills and set plays for the players of modified/frosh/JV and varsity levels. You cater to youth which I know where it all starts but all levels need improvement. You could always stand in front of them holding 1 or 2 fingers and have them call out the number. One thing I would add after they start dribbling and come to a jump stop is a reverse pivot into a triple threat.... maybe a shot fake and pass fake too? Good video, excellence teaching concept. I haven't see it taught in this way. We usually teach keeping the ball out of the bread basket, meaning above the chest and sweep below the needs.